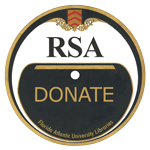 Most of the recordings in the RSA Jazz Collection were originally donated to FAU in 2006 by Dr. Henry F. Ivey. Lovingly accumulated for over 60 years, this collection contains all the jazz greats such as Louis Armstrong, Duke Ellington, Benny Goodman, Billie Holiday, Eddie Condon, Jelly Roll Morton, etc., etc., etc. Additional substantial donations of jazz phonograph records, tapes and CDs were received from the Jack Saul Estate, Richard Shinedling, and others. The RSA Jazz Collection now contains over 21,000 items. About 16,000 have been inventoried so far. Very few have been digitized to date. USE THE PLAYER on the right to hear streaming snippets from the RSA’s Jazz collection. Click here to browse through our full list of inventoried album titles.